Jack 21's Story . . .
Spring has sprung and Mr. Jack is enjoying it to the max. He’s chasing and looking for spring wild life, even standing frequently on hind legs to view what may be outside the fence area! 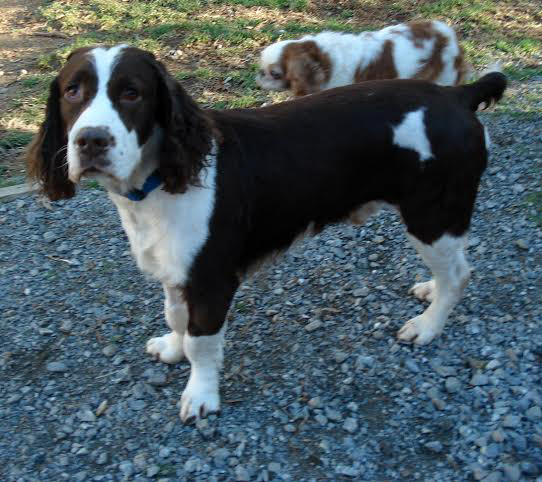 Jack has lost weight since returning to foster care and is back to “healthy” in that area!! His weight loss has given him the ability to burn off steam with running and playing with his four-legged house mates. This has really helped him. 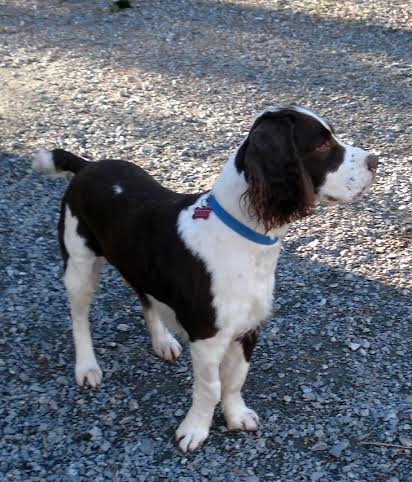 Evaluation of recent blood work is done also and confirms that Jack has no thyroid problem……..which is good! Though still showing anxiety in a worried way periodically, a twice-daily supplement for anxiety has really helped Jack. With previous families and in his foster home, Jack tends to pick a human to bond with heavily and is then slow to accept listening to the other human in the house when going into his crate. This has slowly been improving since coming to his foster home. He will grumble after his foster dad, who was not the chosen one… :-), closes the crate door. Jack sounds really mean with his deep-throated voice but is only verbal with his protest. He crates regularly when his family is away from home for reasonable amounts of time daily and is a boy who will probably always do best with a regular schedule to his life. Toward readying Jack to meet a new family, he’s been visiting a dog training center since he’s been back in foster care. As he’s gotten acquainted there, Jack’s impressed folks who have come to dearly love him and have faith in him! He’s a truly a loving, obedient dog and well-behaved in the house. He needs someone to love him patiently, viewing his downfalls as minimal compared to his great usual nature. It’s anticipated that moving to an adopting home again will set him back slightly. His adjustment period with a new family will likely be longer than that of some dogs. The investment of time toward building a relationship with this handsome boy can lead to great companionship for both Jack and his people. If you have that patient, dog-savvy nature to share with Jack, please ask about meeting him and give him the chance to return in kind. Sometimes, despite the best effort on the part of both adopting family and dog, a placement is not quite the best fit. Hence, nearly a year after being adopted, Jack is back in MAESSR’s care. Returning to his original foster home is a blessing for Jack as he finds his footing in a familiar environment. It is, understandably, still an adjustment but he makes progress each day. He has begun once again to take an over-the-counter supplement to help him with the stress of this transition. In his short time back, Jack has re-learned to re-love the four foster dog siblings that he knew a year ago…a great start! 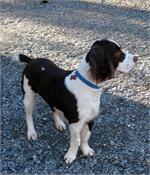 Jack recently visited the vet and was tested for hypothyroidism. General blood work was done as well. Since a few numbers were slightly off, the cause for this will continue to be investigated. Being back in the snowy weather, Jack finds that his foster home suits him to a T because he really enjoys the snow! In fact, the snow is the best therapy for him as he readjusts in his foster home. With the low temperatures hovering at frosty single digits, he still hates to be inside! His family worries about frostbite, but Jack just loves the adventures outside. Squirrels are his main quarry and he loves smelling for those critters…just mentioning the word “squirrel” makes his tail wag! For Jack, the back window in his foster home is simply squirrel television! Jack loves chasing them back into the woods from his fenced yard. The local birds are quite happy to have Jack protecting their food too. Update 03/20/2014: “He sat in front of everyone, looking into their eyes with love, and waiting for the treasured petting and attention!" There’s wonderful news to share…………….Jack is doing great! He was the "star" at his most recent vet visit. Not one person who walked in the door of the waiting room could resist him! He sat in front of everyone, looking into their eyes with love, and waiting for the treasured petting and attention! A cracked toe nail landed him in the midst of such opportunity. The training he’s been doing with his foster family this winter enabled him to shine brightly. He was a great patient when it came time to see the vet too. The toe incident did delay Jack’s last training session a bit. His final exam at training is upcoming. For that, he will be meeting and greeting from the vehicle at a grocery store! Best of luck with that, Jack, but we’re guessing you won’t need luck! 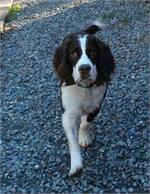 After completing training, Jack will be ready for his new home! He’s doing great with his meds but, given his progress, both his foster family and vet think he could be weaned off of them after a couple months in a new home! This is GREAT news for Jack, long term. Update 02/17/2014: “He LOVES THE SNOW!!! He rubs his face right in it and loves to roll in it." Jack is back in a MAESSR foster home for some training in the proper way to greet new people. While he has been easy going and well-behaved with his new foster mom, he is receiving some assistance for anxiety, beginning a training program and going on errands to learn how to handle new and changing people and environments. This handsome guy is crate trained and sits at the door when he needs to go out. He kindly lets his family take food or toys from him and sits in front of his mom as if asking for direction and attention. He just wants to please. He enjoys chewing his bone and playing with other dogs. Jack’s biggest new adventure is playing in the snow and running the snow blown “race track” around the inside of the fence. He LOVES THE SNOW!!! He rubs his face right in it and loves to roll in it. This young man had a very rough life before he came to MAESSR and is just now learning that a dog can relax and trust folks. Do you have some snow for him?? Keep an eye out for the time he is ready to continue his journey with a forever family. Jack was living with a family in New York state where the young children would shoot him at close range with a BB gun. He was left outside for long periods of time without food and water. A concerned person took Jack to safety and worked with him. She would have kept him, but Jack is now afraid of children, and, since she has children, she called upon MAESSR to help. In his long ride to his foster home, Jack charmed all of the transporters along the way with his excellent car manners. He has also been very well-behaved in his foster home. Another dog started a couple of minor skirmishes with him, but these ended quickly with intervention from the foster mom. This young man is housetrained and crate trained, and has not had any accidents in the house and has not counter-surfed—good boy!! He will get on the sofa and would love to be able to sleep in the big bed with his foster parents (but there is not enough room). He does pull on a leash when being walked, but calms down fairly quickly. Handsome Jack really just wants to please and is always by his foster mom’s side just in case she needs any help. He was started on an inexpensive supplement to help him with his anxiety and this really seems to have made him much more comfortable. Jack has done well with all the people coming and going to and from his foster home; however, he has not been exposed to any children since his arrival. 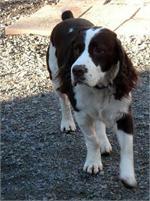 Jack is looking for a home without young children where he can settle down and settle in. He is a lovebug and will do his best to be a great companion. Are you ready to take a 4-year old on walks and cuddle with him on the couch or maybe even your bed? 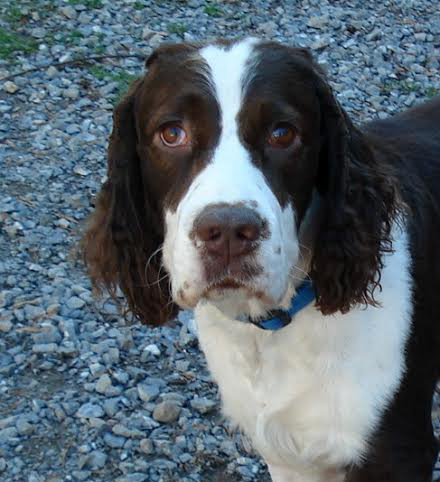 This fellow with the adorable face, classic Springer markings and the cutest white tip on his tail may be for you!